Elizabeth Ann McIntosh 86 of Bloomington, Illinois passed away 6:03 PM December 15, 2017, at Martin Health Center, Bloomington, Il. Services to Celebrate Elizabeth’s Life will be 11 AM, Wednesday, December 20, 2017, at Wesley United Methodist Church, Bloomington, IL with Rev. Vaughn Hoffman officiating. Private family interment will be at a later date. Visitation will be 4 – 7 PM, Tuesday, December 19, 2017, at the church. Calvert Funeral Home, Clinton, IL assisted the family with cremation rites. Memorials may be directed to Heifer International. Elizabeth was born September 28, 1931, in Decatur, IL the daughter of Rev. Harold and Maxine (Anderson) Halfyard. She married Rev. Burt McIntosh December 17, 1950, in Cisco, IL. Survivors include her husband of 67 years, Rev. Burt McIntosh, where they have lived the last four years at Westminster Village, Bloomington, IL; children: Jennifer McIntosh, Normal, IL; Rev. John (Patty) McIntosh, Mahomet, IL; Jane Elizabeth (Keith) Kleid, Coppell, TX; Jeff (Ellen) McIntosh, Stratham, N.H.; Joe (Jerry Gemmecke) McIntosh, Indianapolis, IN; four grandchildren: Sarah Jane, Robert, and Adam Kleid; and Molly McIntosh; sister-in-law, Shara Lee. Several nieces and nephews also survive. 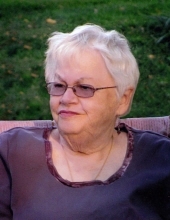 Elizabeth graduated from Indiana State University in 1971 and worked as a Librarian for a short period of time. She was a member of Wesley United Methodist Church, Bloomington, IL. Elizabeth served on the Board of Education, Clinton, IL, was a co-founder of Countering Domestic Violence in McLean Co., IL, and a member of the United Methodist Women and P.E.O. She enjoyed reading, sewing, quilting, and photographing barns. Most of all, she loved spending time with her family.